I remember being blown away by this movie when I saw it in theaters. I was a BIG fan of UFOs when I was a kid. Kevin: I was the same way: 1st saw this in theaters, and I thought it was incredible! Thanks for the comment, and looking forward to my next appearance on the show! Great movie, loved the ending as a kid. @Barl3y: I'm with you! The ending really started my imagination to spinning as well back in the day! Loved this movie. 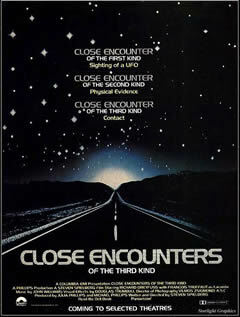 I think its one of Steven Spielberg's classic. I went to see it when was 14 with my mother who didn't like it as much as me. However the hype for this movie was huge & you felt you had see it. My favourite scene when Roy gets lost & he's looking at the maps & waves the UFO to go around,still makes me laugh. @H.E. : I also caught this one in the theater (though I was only around 7 at the time), and the scene you describe as your favorite is one of the ones that stuck with me as well. I, of course, liked this when it came out. But some years later, I accidentally wandered into the mashed potato scene on TV and just immediately assumed that it was a parody. It wasn't. I don't think this thing holds up very well at all! @Beep: Maybe its the "nostalgia factor" (I first saw it in the theater when I was a kid), but I still really enjoy the movie. It holds up for me, anyway. Thanks for the comment!